The shabby shop at the front of Souksabay belies what lays behind. Give it a look because the modern accommodation blocks tucked back from the main road have rooms of crisp white walls, white cotton linens and tile floor. It’s a bit of a squeeze as they’ve packed the room with lots such as a wooden vanity/desk, box TV and stand, side table and chair. The best rooms come with air-con, bedside plug and hot water bathrooms and are well-maintained and clean. Souksabay is not remarkable but its uncontroversial, close to the boat landing and in summary, a decent pick for a backpacker. Rooms here feel fresher and less dated than Pon’s Guesthouse next door—it’s easy to check out both. Souksabay Guesthouse is located across the road from the river, just north of the boat landing. 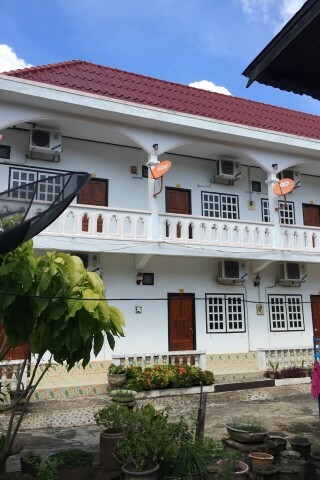 Check rates at Souksabay Guesthouse on Booking.com.